All this week we folded cranes. We are going to the Peace Pagoda again, as we did last year, and bring Jun-san the cranes. She had said they always needed cranes, and if she was not hard at work maintaining the grounds, she was folding cranes or stringing up the cranes that others have brought to her. We imagined that she would be delighted. And though we felt some sadness in missing Ferdinand, it comforted us to think that the cranes may bring comfort or a smile to someone when they find a new home. Sometimes I just want it to all stop. I do not want to do it anymore. Do not want to be a bereaved mother, thinking of how to honor life and my son. I want to drop out, quit, run away. But this grief is like a shadow, it is always with you; you cannot shake it off, cut it off or run away from it. It is just always with you. Sometimes just silent and barely discernible. Sometimes it is like an annoying mosquito. And sometimes it’s an invisible oppressive force that threatens to swallow you up. But it is there, and mostly, by now, I have grown used to it. Comfortable. Might as well get cozy, for it will be with me till I die. And I do need it. I need to feel that grief for it is the only way I can connect to Ferdinand. It is perhaps more than just grief, but also a longing. The girls want to arrange all the cranes into some form or shape. So I may take another photo later today, after we are done folding for the last time. People are amazing. I am still bowed over by the kindness of people around me. People who just stepped up without fuss or words and just held the space for us. Walk along in respectful silence, sat with us and shared in our grief. I will never forget our neighbors at our cabin, who took the girls into their home soon after the dreadful reality broke on us, and just took such good care of them during all the time when we had to be at the hospital. And all those cranes, and flowers, words, food, and hugs. I still feel overwhelmed with gratitude. It is hard to not have a reason. It is hard to not think, “I must have done something really awful.” But along my journey I have met many fellow bereaved who are just the most amazing people. Bright, beautiful spirits with big, generous hearts. Yes, awful things happen to good people. No reason required. Pain is a part of life. I think, pain is a part of being alive, and living, of loving and being loved. It wouldn’t hurt so much if you hadn’t cared or loved. Sometimes it seems to be the only way I can connect to Ferdinand, and I lean deeply into the cut. Grief is sneaky. Some days feel so light, as if a storm never ever descended. And then the heavy hands of grief come and grab you, from behind, right on the throat and all memories flood back like a tsunami and you sink under. Often, it’s best to just surrender. One can never explain how you miss someone whom you never knew. We never saw his eyes or hear him speak, but we miss him sorely. Grief is not just about death. We all experience grief in one way or another. Different forms, and shapes and sizes. We lose something, tangible or not, and we grieve. It is a process of growing and understanding. Accepting and letting go. It is extremely difficult to find the right words. I still am at a loss. Love is so short, forgetting is so long. (Pablo Neruda) One of my favorite poetry lines, ever. Oh yes, life does goes on. Even when you felt it never can. I was incredulous that the earth still spun on its axis; the sun dared to rose and cars still ran on the road. But the truth is there is death every second, somewhere. And we have to keep moving. But we also have to take the moment to bow to it. To appreciate that there is death, so we may live more deeply. I really wish he is here. Miss you so much, Ferdinand. Loving and missing, always. It is true, the body never forgets. And sometimes I think, the universe too. For every July seems long, hot, and oppressive. I will feel hot and bothered, tired and sticky, sad and unbelieving. But then, I guess July’s weather seldom change much. However, this year is a bit different. Lyra has been told about Ferdinand, so we can all finally talk openly about him. Also, instead of staying home and drowning in grief, we ventured out. 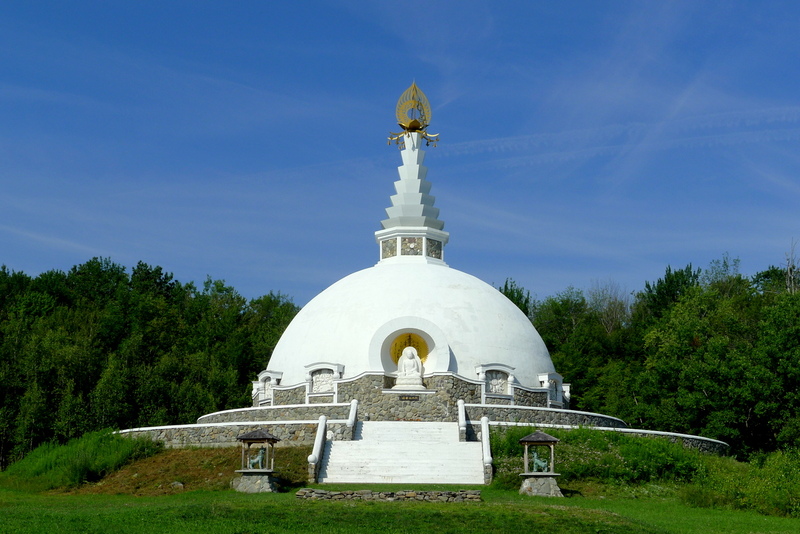 We went to the Grafton Peace Pagoda. I had read about it in a magazine, and last week while we were out picking blueberries at a farm about 15 minutes away from it, we decided impromptu to drive by the pagoda to have a look. It was such a beautiful setting and I could feel peace while walking on the grounds, I decided to go back on Ferdinand’s anniversary, perhaps to sit on one of the many benches on the site and write Ferdinand a letter. It was supposed to be a hot day so we planned to arrive early. 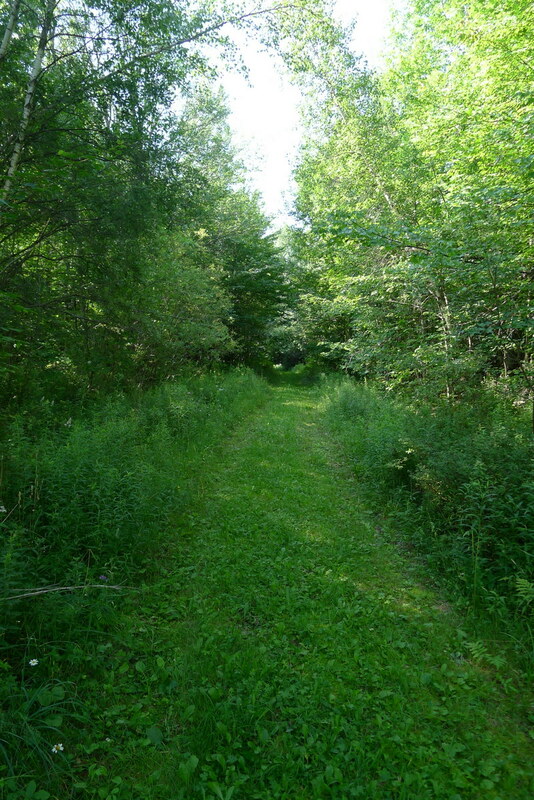 We decided to walk to the pagoda via the “natural trail” instead of up the driveway. 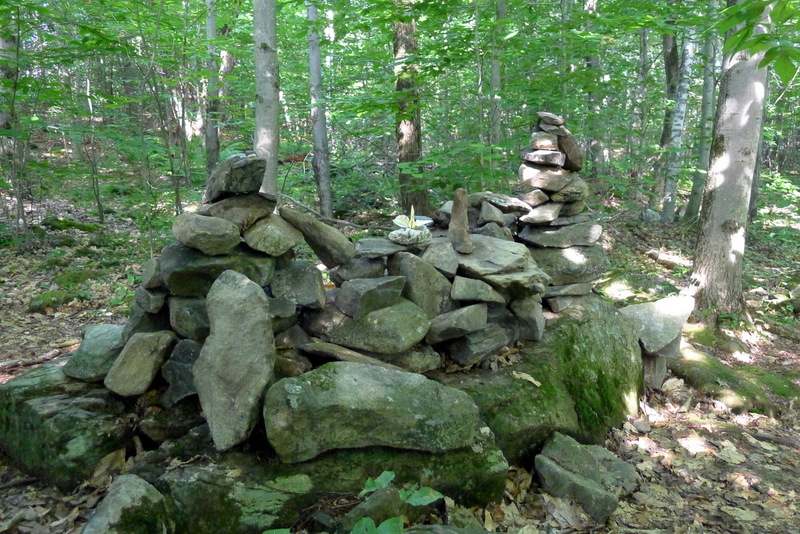 It was a lovely walk, full of greens, and we saw quite a number of cairns along the way. When we emerged from the forest, we were greeted with birds chirping, butterflies fleeting, and bees buzzing.The peace stupa stood regal against the blue sky. After that we found the nun who takes care of the peace pagoda, Jun Yasuda. She first invited us to go to the prayer room for a simple welcome ceremony. We kneeled on mats while she chatted the peace prayer Na-Mu-Myo-Ho-Ren-Ge-Kyo three times, bowing deeply each time. Then she asked where we lived, our names, and so on. I explained to her that we were here because we visited briefly on Saturday and found it to be so peaceful we wanted to be here again on this special day, and was hoping to be able to volunteer for a couple of hours, in honor of Ferdinand. She was very compassionate about it. She showed us to the shed, where we helped to pour sand into various receptacles that will serve as luminaries for Hiroshima Day. Lyra was so happy to be the one to drop a tealight into each receptacle. Jun-san (as would be the way to respectfully address a Japanese) was surprised that we accomplished that pretty fast and asked if we could transport two buckets of gravel located on the steps of the pagoda to a commemorative peace pillar and spread the gravel around. The buckets were pretty heavy so it was team work together with the wheelbarrow. The girls saw some weeds on the ground surrounding the pillar and decided that we should weed as well, so we did just that. 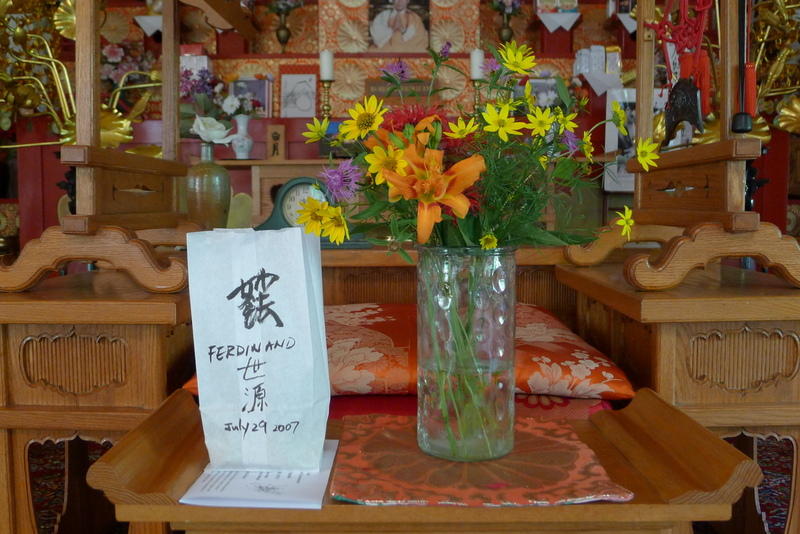 When we were about three-quarters way through, Jun-san told us to please stop and come to the prayer room, where she conducted a simple but beautiful flower-offering ceremony for Ferdinand’s spirit. She had cut 12 stalks of flowers growing on the grounds and put them in a bucket. 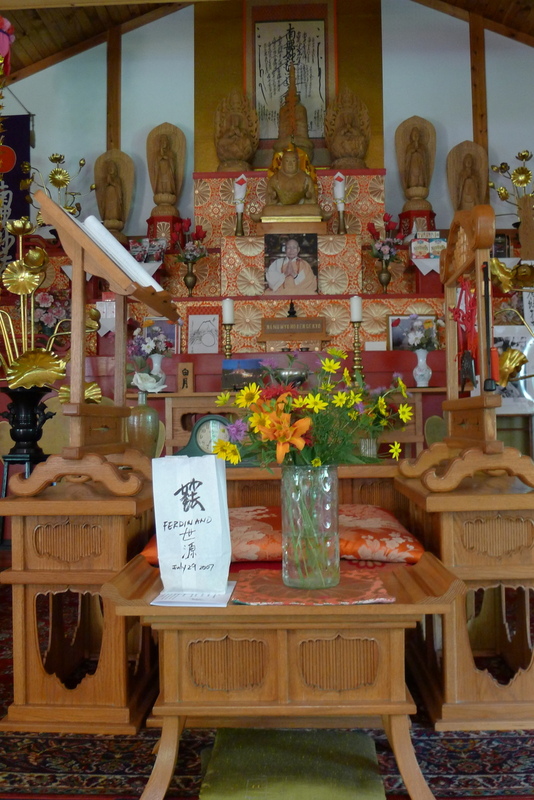 Once she started beating on the drum and chanting, we took turns to pick a flower from the bucket, and then go forward to an altar table to put the flower into a vase, and then bowed three times. Jun-san told us we should bring the vase of flowers home. And then we were invited to the kitchen for a simple cup of cold barley tea and some cookies. There she told us about the peace cranes and the wonderful people who come to visit the peace pagoda. The stories were just amazing. We went back out to finish spreading the gravel after tea, and then we took the vase of flowers and went home. We were hot and tired from our work, but we all felt a sense of peace washing over us. It felt good to say his name out loud and have someone hold his name gently, and our grief so compassionately, without trying to explain it away or be told to not feel sad or to move on. During lunch we all agreed that we were glad to have gone to the peace pagoda. Val even said she feels she is not so sad anymore. Sophia and Lyra did not say anything. Val asked how I felt. I could not really answer, because I still felt that choke in my throat and tears welling up. I felt more at peace, but I still felt sad. I think, that sadness will always be there, but it may feel less strangling. That sadness is just my body feeling love and longing for my son, the star voyager. Still missing you deeply, Ferdinand, and hoping you are happy where you are. We all love you. After seven years, July still surprises me, how much it still hurts. After seven years, we still miss you ever more. Every July, I awaken with hopeful alertness in the middle of the night. Before I open my eyes to the dark, I will tell myself I need to look sharp, in case I see you, for I am sure you will disappear in a blink and I must imprint that image of you deeply in my heart. But you never visited, even though I felt so intently that you are close by. You are so far, and yet so near. You are our star voyager. Far, far away, we cannot reach. We cannot touch. We cannot hold. We cannot kiss our little boy, and pinch his cheeks,. Yet between us we silently toss you within our hearts, cradling you ever so fiercely yet gently. When we sing, we hope the echoes of our voices reach you wherever you are. When we read, we imagine you must hear the stories too, and marvel with us. You would have been seven. A child probably all excited about his birthday celebration, thinking balloons, cake and presents. Maybe trucks, maybe fireworks. Perhaps dinosaurs, or spiders, or a treehouse. Mud, ice cream and tadpoles. I do not know, I only imagine. But I never really try to imagine you as how old you ought to be. You are either the baby whom I held, and did not want to give up to the unknown; or you are the grown-up boy who comes a-knocking on the door, always a dream and forever a fantasy of mine. I think, trying to imagine every year how you ought to be, is just too much for me. I just want to have you tiny to hold, or big to really bear-hug. July is a month on the calendar, always coming after June, never out of line. Yet it always arrives with a long, hard stab. And then it never fails to be a long month, hot and slow. It is a month of memories. I treasure the time to re-visit all those lovely moments, when we anticipated you. And it is good to have the time and space to sit down and let the tears flow, because the truth is, I do not always allow myself the time or space for tears during other times of the year. I have nothing more to say. Still the same things, Ferdinand. We miss you, and we love you, forever more. Yes, it is true. I have a busy life too. Or so I think. But when I try to slow things down, really stand still and attempt to make a list of exactly what I have done, I have an almost blank list, nothing much to add to the usual “busy” stuff and getting from one place to another. So I am not sure how I used to be on Facebook (somewhat) regularly, or write all these posts on this blog. I guess, there was a time when I had no choice but to force upon myself the luxury of grieving. Yes, the luxury. Where you spend the days washing your face with tears, pulling your hair out, shaking your fist at the sun, and all bright beautiful days, searching for and putting together broken pieces. Everything fell to the wayside. 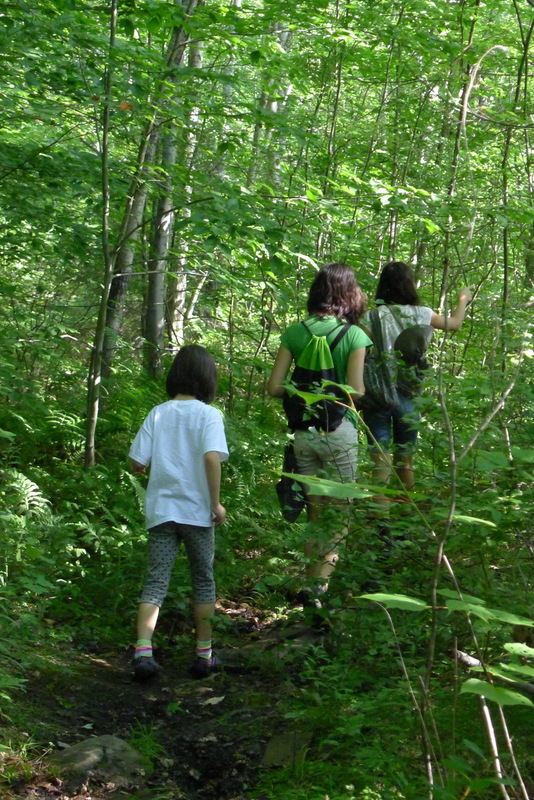 The house crumbled, the yard went insane, and homeschooling went out of the window. Instead I read every book on stillbirth that I could lay my hands on. I crawled through the internet, seeking information: I needed both an explanation and an accurate forecast for the next pregnancy. I read blogs like crazy, with a feverish urgency to connect with others who have experienced similar losses, who could understand my broken heart. And I started this blog. And then I neglected it. The frequency of posts on this blog has plummeted. What does this mean? 500 years later, when an internet archaeologist chanced upon my blog and run his proverbial magnifying glass over the debris of my blog, what will he think? Will he classify this under the category “experienced loss and then moved on”? Or perhaps “Time heals all wounds”? Or “Signifies death of blogs; age of Twitter”? Well, yes, I have moved on. There is no choice but to move on since there is no going back- don’t I wish I could go back and change everything?! I have not forgotten, but the scab does form over the wound, and yes, life gets busy again (full-time grieving can only be a short-term luxury), and the mind gets distracted. But my heart still aches. I still cannot raise my head and look at a star without thinking of my little star voyager. I still sometimes when opening the car trunk or a cabinet will think I may see a shriveled up baby in a bundle, forgotten by his terribly neglectful mother. Most of the time, it is the struggling and healing process after that comes to my mind most. It is just too painful to go back to that day. So, when I was approached by Janel Atlas to contribute a chapter to the book They Were Still Born, I wondered how I would tell my story. Much as I knew it would be a difficult writing process, I was eager to write it, to add my voice to the stories of loss, hoping that someone will hold my words in her hands and nod her head vigorously, and perhaps, find a glimmer of hope after. Writing my piece plunged me viscerally back to the event itself: the shock, disbelief, the searing pain of saying goodbye forever, and then turning around and realizing that no matter how hard, one has to trudge on. As such, I chose to write my piece in third person, thinking it would distance myself from the pain, and also attempting to view my personal story from a distance. I had also hope that, by not giving the grieving mother a name and a face, that others reading the story will be able to identify with it better, and feel that their story could have easily fit in there, and that the hope and healing could be theirs too. However, writing in third person did not make it easier, because it still did not allow me to dissociate my past self with my present self. They are still very much the same person. In writing my piece, I also read back to my blog posts close to the horrific experience, and I winced and flinched at the flooding of strong emotions. Also I felt I used so many words!! So many exclamation marks!! So, I decided to scale back. Used minimal words, and refrained from a direct telling of the emotions experienced by “the woman” but to let the story unfold by itself, to let the reader fill in the details and experience the emotions for themselves. I imagined it was a silent movie and the reader would choose the soundtrack that they preferred and changed the scenery as they like. It was an endeavor to distill everything down to a somewhat skeletal story so that every reader can tailor it to their own experience, their own stories, and yet be able to identify with the events, the same shock, disbelief, pain, and healing… and know that it is truly possible, since she had done it. Yet, I was thankful for the experience and grateful to be included so my story can be told. I hoped it would help someone else understand the experience, and know that re-birth is possible. And I was so proud of the book, not just a collection of wonderful stories, but also with an informative section. I had read so many books on stillbirth but seen nothing like this; a book that could offer emotional solace and also empowering information. I almost burst with pride that I could have something in such a book, that I felt sure was going to make a difference to every grieving family who had experienced a stillbirth. Surely they would find a voice or story in the collection that they can identify with, and feel they have informative resources that would enable them to move on confidently. But would I change my essay given the opportunity? Probably not. It feels now that my piece in the book is like a piece of the puzzle. If I change my piece, I would also change the shape of the puzzle and it would not fit nicely anymore. But I guess it would also depend on the feedback from those who have read the book- if they say, that was an odd piece, then I probably would write something else, because ultimately what I wish to contribute is not just my story, but a step to healing. However, if the publisher would establish a companion page to They Were Still Born, allowing the contributing writers to update on their grieving process, or where they are now in terms of healing, I would be happy to contribute. Life is a meandering path as it is, and it is human nature to wish to see ahead, to find a glimmer of guidance, to know that by putting one foot in front of another and keeping one’s chin up, there will be golden days ahead. 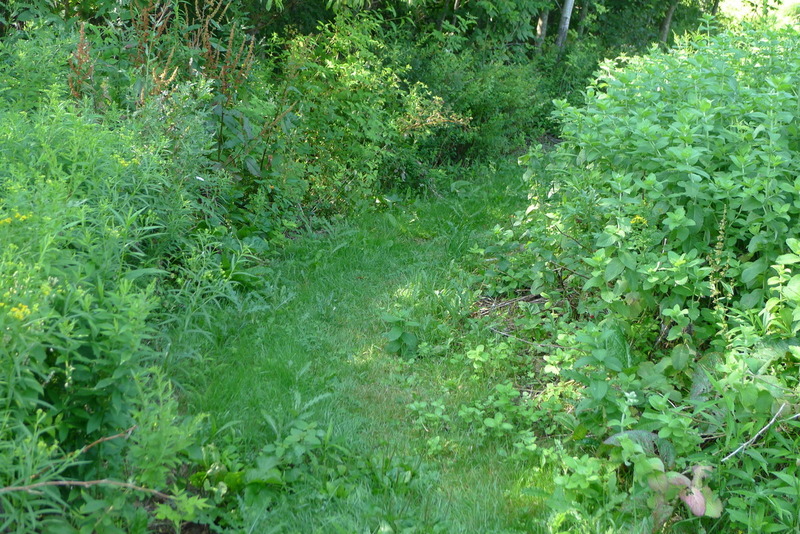 Knowing that many others walk this meandering path is a comfort, and bolsters one’s courage. It may not make a big difference, but every little small thing can be amplified when you feel lonely in your grief and darkness. How about you? Do you think you have left the path of grief? Do you still have the urge to post on your blog, or connect with fellow babylost mothers? I miss you all and hold you all in my heart. 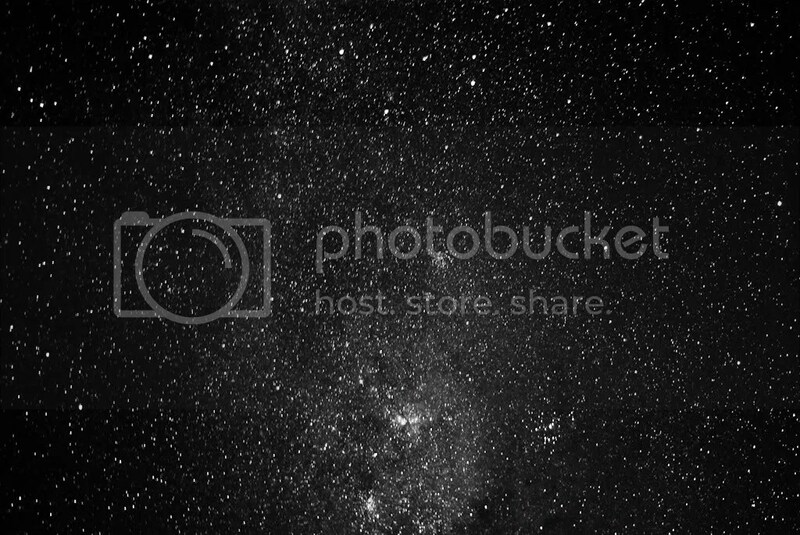 At the beginning of time, the Star Weaver tipped her pot and blanketed the dark night with twinkling stars. And then the people were no longer scared of the long nights. They looked up, and they pointed and they told stories about the stars. The Star Weaver sat, her hair billowing in the gentle night breeze, and she listened to the fantastic stories. And she began to move and arrange the stars so they became like actors on a stage, lined as they should as stories unfold. And the people were happy and comforted, for their stories could now be repeated, and their sons and daughters pointed to the same stars, and told the same stories to their sons and daughters. But the stars grew restless, they did not like staying in constellations. They fidgeted, slipped away, and made mischief. And people began to get confused. The Star Weaver created Star Voyagers, picked from the purest of the celestial beings, to travel amongst the stars, to coax them back in place. One of the Star Voyagers wore winged boots and carried a lyre with him. He would sing soothing songs to the stars and they all loved him. One day this Star Voyager slipped and he fell through the night, carried by the whisper of an earthly woman, and he fell into her womb. For she had raised her head in the deep of the night and wished for a child. He was not sure how that happened, and neither did that woman. But it did not take long for their hearts and souls to connect. The Star Voyager’s time on earth was a wonderful one. He was full of curiosity and every day was filled with amazing discoveries. But soon he began to yearn to be back with the stars high up in the skies again. He knew he has his duties to fulfill and if there were chaos amongst the stars the people may be fearful again. Sadly, he bid his earth mother, his earth father, and his earth sisters good-bye. Oh, how heart-breaking was the farewell! There were so many tears and his earth mother felt she would die from grief. The Star Weaver took pity on the earth mother. She plucked a star and place it on the Star Voyager’s lyre, so that she may always know where her star-child is, when she cast her eyes up to the sky, in search of her Star Voyager. And so, to this day, the Star Voyager continues to travel across the starry sky, carrying his lyre with a star on it, and every night he sends love down to his earth mother, and earth father, and earth sisters. you are ever so missed. I know it is coming just like someone with arthritis feels the chill in the bones. The air feels denser and oppressive. It is always too hot and the days seem long and annoying. I ache, and my mood plunge. It is not that I do not feel the grief at other times of the year. I do, unpredictable as it has become. But as time wore on, grief wears softer, like an old T-shirt washed many times, its fibers all soft and forgiving, and one reaches out and puts it on without much deliberation. But in July, the grief is always jarring, demanding attention. And I have to abide- literally wilting under the glare of its hot stare. It is uncomfortable, because at other times I hardly talk about Ferdinand anymore, except with those in the circle. Yet it is comforting in an odd way, knowing that my body instinctively remembers. The time is here again, when my mind swims with memories, stars, ruby shades and disbelief. My body aches all over and my world seems to warp in dangerous ways that threatens to shatter. I open the door to a dusty, empty room. I sit, and I wait. Perhaps he will knock. Somebody wise said that once, and I totally agreed. Which is why I was rather sane when I turned 40 yesterday. I was OK. I did not freak out, or go out to buy one hundred pairs of shoes, as R feared I may. I did not look up plastic surgery of any sort. I patted my soft little middle aged belly and took a second helping of the chocolate hazelnut cake that comes from an amazing, small Romanian bakery, giving thanks to their existence and contemplated begging for an internship. Or just to lick the bowls. It is a privilege to grow old, to add another digit to my number of living years. My birthday is so close to Thanksgiving it is hard to not feel grateful when it rolls around. I am glad to be alive and surrounded by my immediate family, I am glad to be able to cook and clean and breathe with them, to watch the girls grow and to hear the garage door grunt open every evening when R comes home from work. I am glad to be able to shiver with cold and mutter bitter complaints when I go out in this chilly weather. I finally understand why the sun was worshiped. But I am not wise yet. I still think, why can’t he be here too? Why not give me one more thing to be grateful for? I still hated it when the server at the French restaurant gushed about our three beautiful girls. How grateful I felt! And yet how I hated the convenience of the phrase “three girls”! I sat and wondered, if there was one boy in the mix, how would those strangers have expressed their admiration? Or perhaps they would be dismayed that I was robbing the world of more resources than I ought to. Maybe they think I have nothing better to do but to stuff the landfill with more stinky diapers. Perhaps someone will say, “How do you do it with four kids? !”, with an underlying note of hysteric. And I only wonder, How do I do it without my missing child? Nothing to do but to move on, and deal with the silent ache. 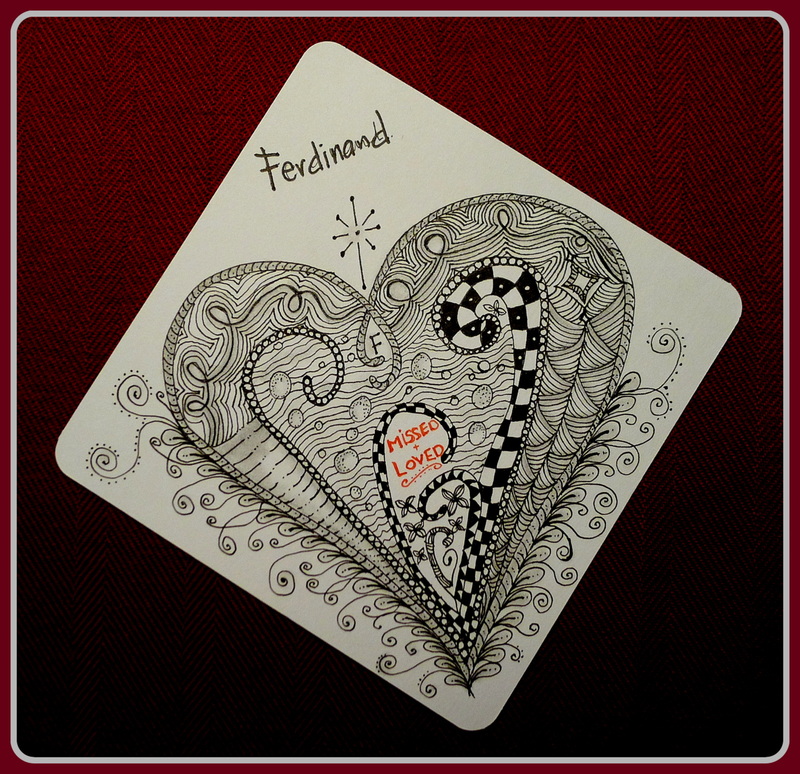 Don’t we all miss you too, Ferdinand! How I wish you were here. I mean physically here. My dear friends, thank you if you still read here. I apologize for the scant internet presence. I vow that one day I will go back to my Reader again, and catch up. This is my precious little corner, where I can come and shed all the tears I want, and I am forever thankful for all of you who had listened and offered comforting words. I think, if you have not done that, I am not sure I would have lived to write about my 40th birthday (which was actually pretty uneventful). While my priorities have changed, your place in my heart haven’t. If you would like to exchange snail-mail with me, please contact me! Otherwise, I am sure one day we will meet again.